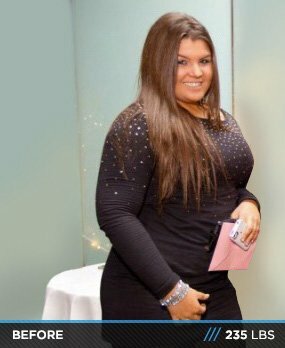 Body Transformation: Jasmine Kissed 74 Pounds Goodbye! Jasmine won't live the best years of her life in an overweight body. At age 15, she chose to alter her future and lost more than 17 percent body fat in one year! I believe that everyone has a certain vision they go to sleep with and wake up with every day. For me, it was to have the body I always dreamed of. Growing up, I was never considered a skinny girl. I was always on the chubby side and used to tell myself that's the way it was. I used to say things like "I can never lose weight" and "This is just how I'm built." I got tired of making excuses and constantly accepting something that didn't have to be. I realized that weight isn't a disease unless you let it become one. With a little hard work and dedication, weight can be changed. My brother has been into fitness and training for four years. I always used to see him prepare his meals, take supplements, and go to the gym 4-5 times per week. I used to make fun of him for being strict with his training and diet, but secretly admired his willpower and the time and effort he put into his goals. I wanted to set my own goals. He constantly tried to encourage me to hit the gym with him and I finally caved and accepted the challenge to set a goal and accomplish it. I wanted to feel a sense of pride. I wanted to show myself and others that I had the capability that everyone doubted. After two months of consistent dieting and training, I saw results and was down 25 pounds. I was extremely proud of myself and had intense determination to keep going and further my results. I stopped craving junk food and began to crave results instead. I had amazing support from friends and family, and people at the gym encouraged me every step of the way. After 11 months of consistency and steady progress, I lost an incredible 74 pounds. I realized you can do whatever you set your mind to. You can set out to be whatever you desire to be. The time you put into sulking and putting yourself down can easily be used to change and bring yourself up. If you want it bad enough, you have to work for it. You get what you put in and must always remember that miniscule results are better than none. I accomplished my goals solely by believing in myself. I learned to stop looking at how much I still had to accomplish and focused on what I already accomplished. I had so many people supporting me throughout my journey. People at the gym cheered me on and complimented me on my results and my family was completely supportive. My brother was my biggest supporter. He pushed and motivated me every day to train harder and get stronger. He believed in me every step of the way and I refused to let him and myself down. Dieting is extremely important, especially when you're cutting weight. If you aren't eating properly, you won't go anywhere with your training. You have to eat clean and train dirty. I typically do lower weight with higher reps until I feel the workout is getting too easy, and then I increase the weights a few pounds. I like to train six days per week and incorporate plenty of cardio and mobility work. Avoid bro science at costs and put your all into training. Dieting is the hardest challenge of losing weight. When people plan to lose weight, they automatically think they need to starve themselves. In the beginning, I was one of these people. I cut my calories a drastic amount and did cardio like a maniac. I realized it was a horrible idea because I gained the weight back and started from scratch. Proper training and eating helped me lose more weight than fad dieting and starvation. Consistency and determination are key! I like to set new goals for myself. I plan to lose about 20 more pounds and gain more muscle. I want to become stronger and more powerful also. I would love to participate in powerlifting meets and enter a physique competition. Put your heart and soul into training. Be confident in yourself and your goals. Do it the natural way. No diet pills or fad diets. Stop trying to be better than the next person. Do this for yourself. Bodybuilding.com motivated me significantly. It's awesome to see a bunch of different people setting out to reach goals and transform their bodies. It makes you feel that you're not walking through this journey alone.